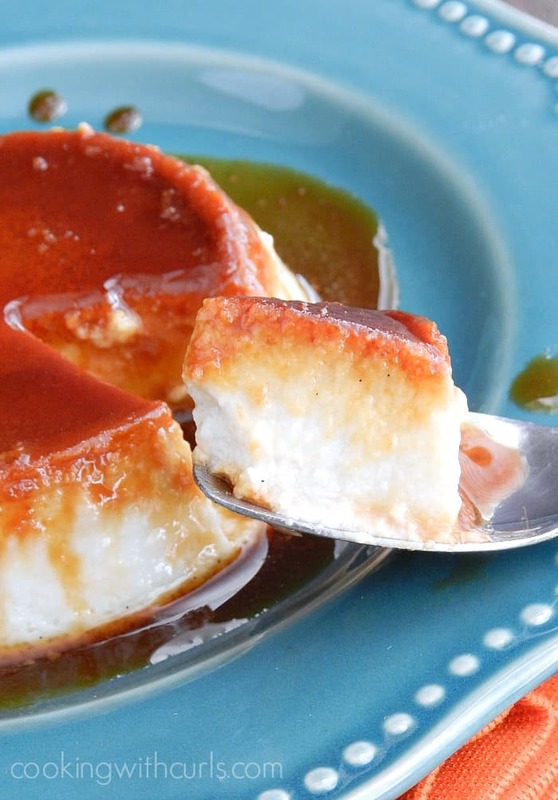 No meal in a Mexican restaurant is complete without Caramel Custard. Unless of course you are lactose intolerant, then you just have to watch everyone else enjoy theirs. Well now you can make your own! 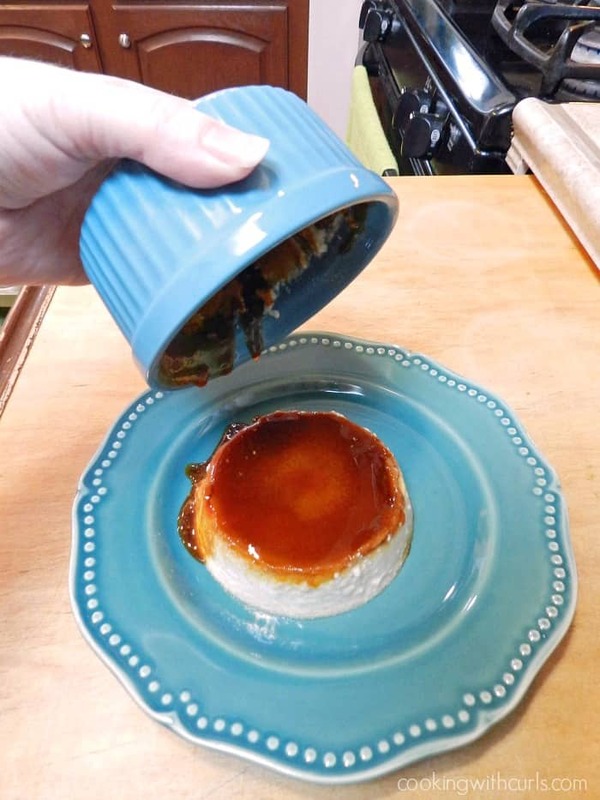 Okay, it might not be exactly the same as being able to enjoy your dessert in a restaurant…..
You will have to enjoy your Caramel Custard at home, but at least you will get to experience this rich, creamy custard surrounded by a puddle of caramel goodness!! Ahhhh! Caramel Custard is very similar to Creme Brulee. Both are topped with caramel, but this version has a soft caramel that melts and surround the custard. 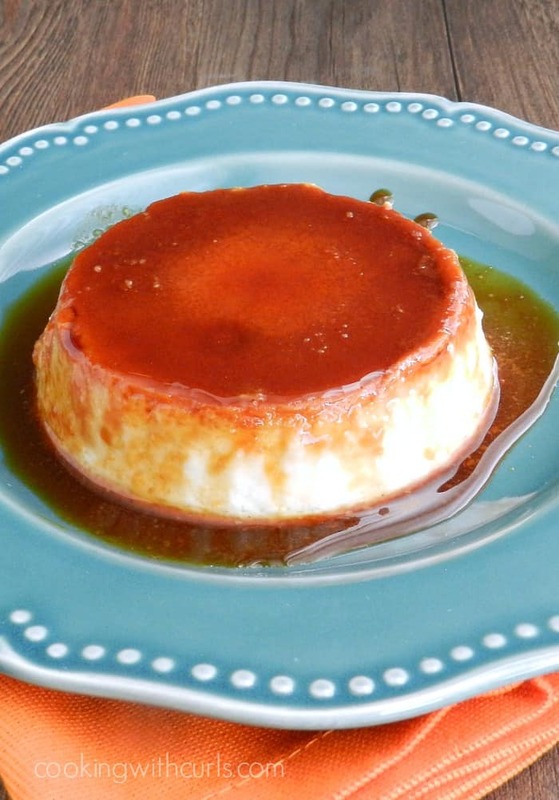 Many restaurants in the United States also refer to this dessert as Flan, but it has many different names around the world. The texture of the dairy-free version is not as smooth as the original. It has a grainier texture, but is still quite delicious. The overall flavor is a perfect match!! I used a combination of canned full-fat coconut milk and boxed coconut milk to make the dairy-free version. How do you make Caramel Custard? Place six ramekins in a pan full of hot water. Pour sugar into a large saucepan. Shake to spread evenly, and heat slowly without stirring. Tilt the pan back and forth until the sugar melts. When the sugar turns a rich golden color, pour the mixture into the ramekins and tilt to spread evenly until the bottom is coated. Set aside. Preheat oven to 350 degrees. Pour the coconut milks into a saucepan, and add the vanilla bean. Heat milk to just below the boiling point. The liquid will start to move and swell, and form tiny bubbles around the edge of the pan. 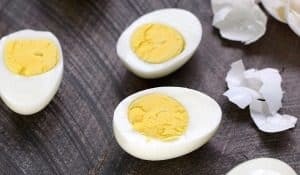 Beat eggs in a large bowl. Gradually beat in the sugar. Remove the vanilla bean from the milk, and add the vanilla extract. Gradually mix into the eggs. Strain the mixture into a bowl (I used the original milk bowl). Ladle mixture into caramel lined ramekins and place into a large roasting pan. Pour boiling water into the roasting pan until it reaches halfway up the sides of the ramekins. 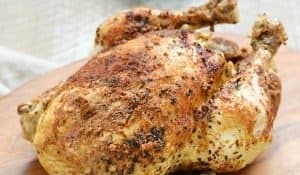 Place pan in the oven and bake for 40 minutes. The custards are done when a slender knife blade comes out clean when inserted into the center. 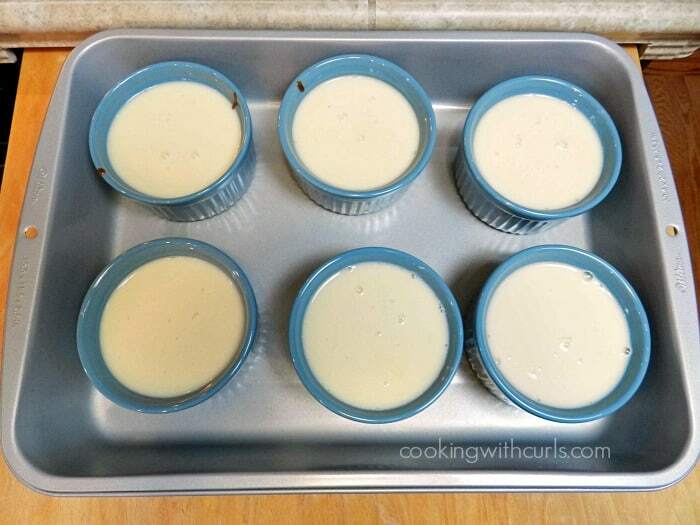 Lift the ramekins out of the roasting pan, and set aside to cool. Chill in the refrigerator for several hours before serving. To serve, run a knife around the outside edge of the custard. Place on a serving plate, and flip over. You may need to shake the ramekin, or tap the bottom to brake the seal. 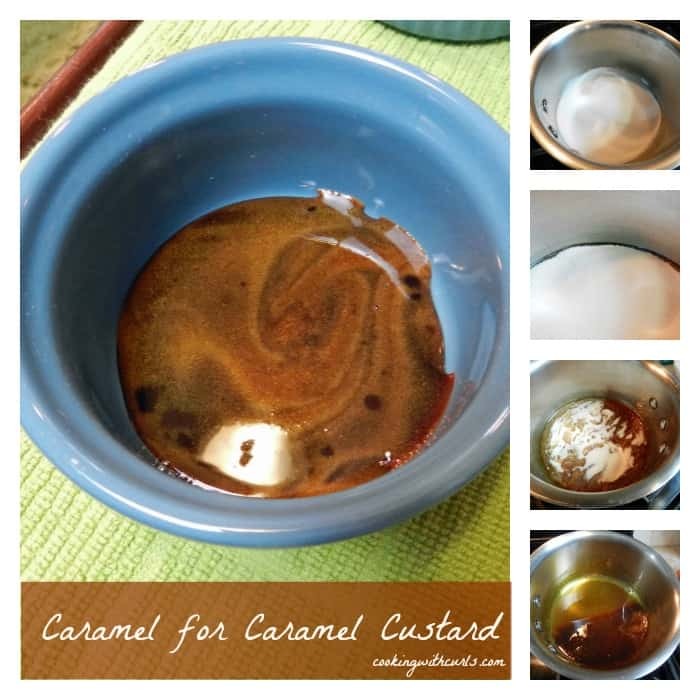 Caramel will puddle around the base of the Custard. I was afraid that the canned milk would be too thick, and the boxed milk would be too thin. The combination of the two was quite similar to the consistency of whole milk, which is what you would use to make the original version. The trickiest part of this dessert, is making the caramel. It can go from “why won’t you melt” to “oops, it’s burnt” in the blink of an eye. So you need to keep your eyes on it! Trust me, if I can do it…..you can do it! Well we are now halfway through our Cooking with Astrology “Libra” meal. We started (unofficially) with Margaritas. Followed by Zucchini Fritters with Pine Nut Sauce as an appetizer. Then Chicken Fajitas for the main course. Next up is Huevos Rancheros!! Oh Yum! 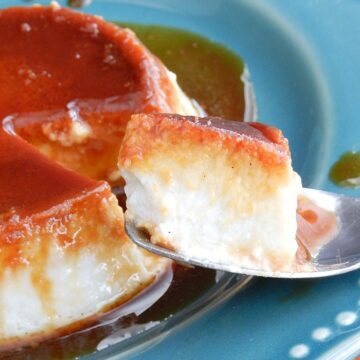 Rich and delicious dairy-free version of Caramel Custard, one my favorite Mexican restaurant desserts! Remove the ramekins from the water and dry thoroughly. When the sugar turns a rich golden color, pour the mixture into the ramekins and tilt to spread evenly until the bottom is coated. Set aside. I’m in love with your dairy-free version, it looks awesome! Does it taste of coconut though? I’ve never used coconut milk in baking so I don’t know if it actually has a coconut flavor. Hi,I’m a new follower from the linky party. Thanks for co-hosting! : ) That caramel looks delicious! Lisa, I absolutely flip for Creme Brulee or Caramel Custard – yours looks absolutely decadent! I love your comment about cooking the caramel because OMG how true is that?? I’ve had the oops moment a number of times, including once when an entire saucepan could not be saved! Thanks for sharing and pinning! Have a happy Sunday! Looks great! I always wondered how you make flan. 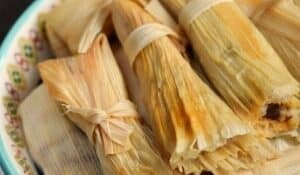 I had some a while ago and always wondered how to make it. Thanks for sharing! Hi Lisa, thanks for linking up to MM tonight! Sharing on FB and pinning! Oh, this looks delicious! I love cooking with coconut milk. I’ve never made custard before but I might have to give it a try now. This looks do-able! 😉 Thanks for sharing on Saturday Night Fever! Pinned! I was just talking to a friend about flan yesterday. Glad you posted this, Lisa, my husband will be happy! Pinned.